Sts. 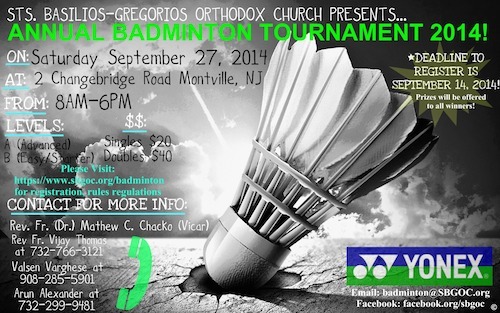 Basilios-Gregorios Orthodox Church of North Plainfield, New Jersey is hosting a badminton tournament and welcomes all participates, both beginner and advanced players. The tournament is on Saturday, September 27th at Montville, New Jersey. If you are interested in participating, please register at www.sbgoc.org/badminton.